Amazon earnings: How Jeff Bezos gets investors to believe in him. 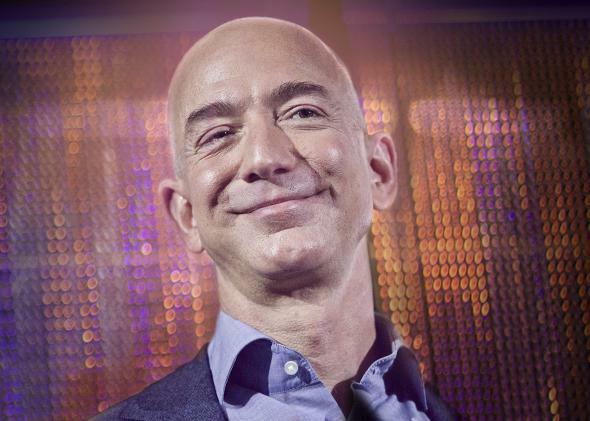 How Jeff Bezos won the faith of Wall Street. Investors were willing to believe in Jeff Bezos, so Bezos could afford to stop proving that he knows how to turn a profit. E-commerce was king this past holiday season, with Christmas surge orders overwhelming UPS’s systems and forcing $100 million in upgrades to prevent future fiascos. So it was no surprise on Jan. 30 when Amazon reported it had become even more enormous than ever before. According to its latest earnings report, the online shopping giant’s net sales increased 20 percent compared with the previous holiday season—a number that would seem staggeringly high if it weren’t so routine for a company that’s been growing rapidly for years. Yet the company’s net income of $274 million for all of last year was tiny relative to its sales of $74.45 billion. Amazon’s profit margin was virtually nonexistent. Meager as last year’s profits were, they represented a small improvement from 2012, when Amazon actually lost money. Even with the slight uptick in 2013, Amazon earned substantially less profit than it did back in 2008, when it posted a net income of $645 million on relatively modest sales of $19.17 billion. Over the past five years, in other words, the retailer of the future managed to more than triple its sales while slicing profits by more than half. It’s a business success story like no other in the world. To understand the significance of Amazon’s lack of profits, you need to distinguish it from another class of unprofitable company: the high-tech startup. Technology companies backed by venture capitalists often rise to prominence without showing profits. This often becomes a source of amusement or confusion when, for example, Instagram sells for $1 billion to Facebook with no revenue, or when Snapchat turns down a $3 billion buyout offer with, again, no revenue. The prevailing theory in Silicon Valley is that it’s a mistake for new companies to focus too much on developing revenue. People use a social service such as Pinterest in part because many other people are using it. Under the circumstances, it makes sense for a company to focus first and foremost on building a great product and getting people to use it. Once you’ve reached a critical mass of users, then comes the time to think about revenue strategies. This approach sometimes fails (and it’s entirely possible that Snapchat or Instagram will prove to be white whales), but it has a great deal of logic and precedent behind it. Once upon a time, Google and Facebook were just impressive products with little or no revenue. Today they’re financial juggernauts that have parlayed their user bases into an advertising bonanza. Twitter is partway down this path, and others will follow. Amazon doesn’t fit this mold. For one thing, it’s hardly a young startup anymore. It was founded in 1995 and held its initial public offering way back in 1997. Most obviously, it’s not a firm with no revenue or with an unclear revenue strategy. You go to the website, you find items you might want to buy, and those items have prices next to them. If you decide you want to buy, you enter credit card information and get charged. It’s the most boring revenue strategy in the world, and one of the oldest. What’s more, it’s not as if Amazon has never been profitable. No large retailer has especially large profit margins, but for several years in the mid-aughts when the business was smaller, it obtained margins that were right in line with Walmart’s. This image of a firm that remains a darling of Wall Street despite a lack of profitability is tempting. But the truth is more likely the opposite. Amazon doesn’t turn a profit because it’s a darling of Wall Street. I once characterized Amazon as a “charitable institution being run by elements of the investment community for the benefit of consumers.” Bezos took issue with this in a letter to shareholders. His argument is that Amazon isn’t a charity; it’s a business—a business whose strategy is to make its customers as happy as possible. And that, fundamentally, is what makes Amazon great. Profits are in severe tension with the idea of pleasing customers—a profitable firm is, by definition, charging customers more than it needs to. But of course, there’s a reason that most companies try to make healthy profit margins: financial markets demand it. Only a Wall Street darling, a firm whose senior leadership has the confidence of markets, could get away with being as daring as Amazon is. The timing of Amazon’s high-margin years is no coincidence. Amazon is, in a fundamental way, a child of the dot-com boom of the 1990s in a way that none of today’s other technology giants are. Apple and Microsoft long predate the bubble, and Facebook was founded long after it burst. Google existed in a modest way in the 1990s, but didn’t participate in go-go ’90s finance; its 2004 IPO was a key step on the march of technology stocks back to respectability and credibility after the bubble burst. But Amazon was right in the middle, born into the maelstrom of Clinton-era corporate finance. All stock prices soared in the late ’90s. The historical memory of a “tech bubble” ignores the fact that very prosaic industrial firms like Ford have lost more than 50 percent of the 1999 peak value. But while investors smiled on all stocks in the ’90s, they did take a special shine to technology stocks. An established company with a real business like AOL could obtain a valuation high enough to allow it to swallow all of Time Warner. And to attract investor enthusiasm, a startup didn’t really need anything at all—not a business model or even a good product—beyond a “.com” at the end of its name. Under the circumstances, Amazon was no more under pressure to demonstrate profitability than was Pets.com or Kozmo.com or any of the other in-retrospect-hilarious white elephants of the era. Amazon didn’t avoid the corporate graveyard by refusing to indulge in the mania of its founding era. Like many other dot-coms, it steadily lost money in pursuit of growth. It was a well-timed bond offering in February 2000—just before market sentiment turned—let Amazon ride out the cash crunch that brought down so many other firms. That money bought Amazon time, and they used that time to change course. They lost $567 million in 2001, but only $149 million in 2002—and the last quarter was profitable. By 2003 they eked out a modest $35 million profit, which rose to $588 million in 2004. Wall Street was suffering from a massive Internet hangover, and Bezos provided the cure. A native e-commerce player that sold things for more money than it cost to obtain and deliver them. A concrete demonstration that the Internet was a real business platform. The profits were not particularly large—J.C. Penney reported a $1.3 billion operating profit in 2004—but they were real at a time when Wall Street wanted to see real profits. As the years went by, Wall Street found itself enamored again with high tech. Google’s emergence as a advertising juggernaut, the explosive growth of Facebook, and the enormous popularity of the iPhone all laid the groundwork for today’s techno-enthusiasm. And Amazon quietly took advantage of that spirit of re-enchantment to stop worrying about profits. In the five years after 2004, Amazon’s profits nearly doubled to $902 million. But in the same period, total sales increased over 250 percent to $24.5 billion. These kinds of rapidly declining profit margins are the sort of thing a firm normally tries to avoid. But with a benign investor climate, Bezos could argue that growth is growth and margins are fundamentally irrelevant. In subsequent years, financial markets only smiled more fondly at the technology sector. Instagram sold to Facebook for $1 billion. Tumblr sold to Yahoo for about the same amount. Snapchat’s young founder turned down a reported $3 billion. People began to ask if Instagram had sold itself short. Twitter pulled off a successful IPO, and its shares have risen since. The dream of the ’90s, in other words, is alive in Silicon Valley. And that dream is the context for Amazon’s recent financial performance. Profits peaked in 2010 at $1.1 billion—impressive 28 percent growth from the previous year, but still a further diminution of profit margins in the context of 40 percent sales growth. Then profits fell 45 percent the next year even as sales grew 41 percent. Two years later, Amazon’s 2012 sales had nearly doubled to $61 billion from more than $30 billion, and yet the company posted its first loss since 2002. Investors were willing to believe in Jeff Bezos, so Bezos could afford to stop proving that he knows how to turn a profit. But it should be no mystery why tech companies in particular are slow to invest—they buy lots of computer equipment, and thus are operating in a strongly deflationary environment. On average, prices rise over time. But the price of a brand new iPhone 4S has fallen by about $200—over 30 percent—since its release two years ago. And the batteries whose functionality is so central to mobile devices are actually the element of the digital technology world where we’ve seen the least progress. Under the circumstances, it makes lots of sense to hang on to cash and invest next year rather than splurging today on equipment that will soon be obsolete. Pair that with high-margin underlying businesses, and you have a recipe for massive cash hoarding. Yet the hoarding turns the firms into targets. No doubt Steve Jobs believed the cash pile he was bequeathing to Tim Cook when he died was an enormous asset, on par with Apple’s strong brand and engineering talent. But without the company’s charismatic founder on hand, it’s in some ways become a problem. Cook immediately set about trying to appease shareholders with a dividend and buyback program that soon grew more generous. This has only whetted the appetite of activist investors led by Carl Icahn to demand more money. Rather than saving for the future, Apple’s become a cash source for financial engineers. Google, for now, is still firmly in the hands of its founders, but nothing lasts forever. Microsoft has stumbled in recent years, and now activist investors are rumbling about trying to wrest control of the board of directors away from Bill Gates so the company can abandon the Steve Ballmer strategy of plowing Windows/Office profits into new ventures and instead become a piggybank. For founders, executives, and technologists who care on some level about the fate of their companies and the idea of innovation, this is a depressing outcome. The geeks and engineers create the companies, but in the end they become pawns in the struggles of Wall Street. One thing that makes Amazon different is that Bezos, a veteran of hedge fund D.E. Shaw, is himself a finance guy rather than an engineer. Understanding Wall Street as he does, he’s hit upon the ultimate way of avoiding the piggybank problem—just don’t earn the profits that create the cash hoard in the first place. Invest the revenue instead. To really understand this strategy as it applies to Amazon, you simply need to recognize that not every investment—in the sense of a future-oriented financial commitment—is an investment according to the rules of corporate accounting. If you take a bunch of money and use it to build a server farm or buy an office building, that’s an accounting investment. Amazon does plenty of this kind of investment But what doesn’t show up on the balance sheet in the same way is the company’s most important investment: the firm commitment to ultra-low prices. A simplistic pricing strategy looks like a parabola. The less you charge, the less money you make per unit sold, but the more units you sell. Plot all the different possible price points and you get a curve. The goal is to pick the price that puts you at the peak of the curve, maximizing your profits. Amazon’s prices almost certainly aren’t set at this peak. Take Amazon Prime, the $79-a-year membership program that entitles you to free two-day shipping on most items. Would membership really drop 10 percent if the fee were raised to $87? It seems unlikely. In fact, Amazon has allowed inflation to slowly eat away at the real price of Amazon Prime while simultaneously sweetening the pot by adding a large suite of free streaming video and the Kindle Owners’ Lending Library to the deal. The price strategy isn’t to maximize revenue or profit; it’s simply to maximize membership. The same strategy appears to underlie the pricing of Kindle and Kindle Fire hardware, which is sold at cost. The idea is to get Kindles into the hands of as many people as possible because Kindle owners will buy Amazon digital content. But this isn’t a digital version of Gillette’s strategy of offering customers cheap razors in order to sell high-margin blades—the Kindle content is also cheap. * (Indeed, it’s so cheap that book publishers and Apple teamed up to create an illegal cartel to make the content more expensive.) The goal, rather, is to enmesh larger and larger groups of people more and more deeply in the habit of purchasing digital content and doing it through Amazon’s platform. Prime members, by the same token, will rely on Amazon for more purchases. Indeed, Prime serves as a gateway into other Amazon discount programs. Subscribe & Save offers a 15 percent discount (20 percent with a real or fake baby) to people who order regular deliveries of household goods or nonperishable groceries. It’s extremely challenging to earn profits at these price points, but the goal is to get people to reorganize their lives around Amazon’s delivery infrastructure, not to make a quick buck. Roger Davidson, a former grocery executive at Wal-Mart, Whole Foods and Supervalu, said Amazon will struggle to make money from AmazonFresh because fresh produce can easily go bad in storage warehouses and get damaged during delivery—something known as “shrink” in the business. These past failures are precisely what make grocery delivery such a great business opportunity for Amazon. In its current Seattle, Los Angeles, and San Francisco markets, Amazon Fresh offers delivery fast enough that you can order in the morning and have groceries by dinner, or order by 10 p.m. and have them by the next morning. It really is challenging to make money doing this. But if Amazon can just manage to cover its costs, then it will have gained invaluable infrastructure. Once you have the trucks and warehouses to deliver at this pace, you can deliver much more than groceries and kill the brick-and-mortar store’s final advantage. This past Dec. 23, I found myself in downtown Washington, D.C.’s Barnes & Noble in search of a last-minute Christmas gift. It was the first time I’d seen the store crowded in years—full of people looking to grab something before they headed out of town. Climbing this final hurdle through a viable same-day delivery system is a holy grail for Amazon, driving a range of its activities (including the much-hyped experimentation with drones). But fast drone delivery has a lot of technical and conceptual problems. The grocery model—lots of warehouses, lots of trucks—is in many ways more promising. AmazonFresh doesn’t need to make money. It just needs to bring in enough money to finance its own creation. The most staggering thing about the no-profits business model is to contemplate the extent to which rivals are simply helpless in its face. “There is just no way to compete with them on price,” Sarah Rees of the English independent bookstore Cover-to-Cover told the Observer’s Carole Cadwalladr in her Nov. 30 inquiry into the store’s rise in the United Kingdom. The main focus of the Observer story is the working conditions at Amazon’s fulfillment centers (which are not very pleasant—read Mac McClelland in Mother Jones for a great look inside the bleak working conditions in the American warehouses), and it links indie bookstore owners’ inability to compete with Amazon to its brutal exploitation of workers. Higher pay would, of course, increase Amazon’s cost. But their competitors’ dilemma is more fundamental. A company that’s trying to turn a profit simply can’t compete on price with one that isn’t. What’s more, the mismatch between when your credit card company pays Amazon for the stuff you’ve bought (typically within a day) and when Amazon pays its suppliers (often as slowly as 90 days) gives them free money to play with. This kind of “float” is a tiny edge, but across an enormous volume of transactions, it amounts to an enormous amount of cash to fuel the enterprise. Small firms can’t match that, but may be able to cope by offering intangibles or sentimental value that a globe-striding behemoth by definition can’t match. And, indeed, there is evidence that independently owned bookstores are back on the rise in America, offering yin to Amazon’s yang. But for other large, impersonal retailers, a match-up with Amazon is a disaster. How do you turn a profit competing with a company that doesn’t? This is why efforts by Walmart and other incumbent retail chains to get serious about e-commerce are very likely to fail. A zero-margin, same-day nationwide grocery delivery service is a win for Amazon, which currently doesn’t sell groceries in most of the country. But Walmart does sell groceries. Lots of groceries. In a broad and growing set of locations. For Walmart to compete with Amazon via a zero-margin delivery arm wouldn’t just be competing with Amazon—it would be competing with Walmart’s core business. Rather than staving off Bezos’ juggernaut, the plummeting profit margins would be seen as evidence that the company is succumbing to the impact of facing its competition. The natural question to ask about the zero-profit juggernaut is where it ends. A common assumption is that Amazon’s long game is to grow at near-zero margins for some period of time and then “flip a switch” to jack up prices and watch the money roll in. This is possible. But if it happens, it’s more likely to arise as a result of a loss of investor confidence than as a deliberate plan. At the moment, no other company can get away with an Amazon-like business strategy. Wall Street won’t let them get away with it—the princes of finance demand dividends and share repurchases and the profits that finance them. Amazon gets away with relentlessly investing in the future only because, for now, investors have faith in Bezos and his strategy. But that faith has been tested in the past, and it’s likely that some future convulsion in markets will cause it to wane again. If it does, the company will likely need to return to its mid-aughts strategy of increasing profits and even profit margins. That’ll likely mean slightly higher prices for almost everything, the elimination of some hard-to-ship items from Prime eligibility, and a reduced pace of entry into new markets. As a result, the pace of growth will almost certainly slow. The question will become whether or not faith can be restored. Perhaps if Amazon transforms itself—even temporarily—into a firm that’s both large and profitable, the piggybank effect will take hold. Once the company has steady profits, the demands to disgorge the cash may become impossible to resist. A retreat into permanent conventionality is especially likely if Bezos were to turn his interest to other things as he gets closer to 60. Bill Gates, after all, was in his early 50s when he decided to focus primarily on his philanthropic efforts rather than the business world. A company still run by its charismatic founder—especially a charismatic founder who also happens to be the major shareholder—has a much easier time following unorthodox business strategies and keeping an eye on the long term. In theory, executive compensation schemes linked to stock market performance are supposed to focus managers on the long view. But in practice, the opposite seems to be the case. In an impressive paper published in April 2013, Alexander Ljungqvist, Joan Farre-Mensa, and John Asker found that publicly traded firms systematically under-invest compared to privately held ones. The effect is larger in sectors where stock market swings are more closely tied to quarterly earnings reports, indicating that what they call “managerial myopia” is likely the culprit. In other words, when you pay executives to increase the share price, they focus on increasing the share price—even when that means focusing on headline numbers in the next quarterly financial report rather than on the long term. Obviously a series of reports featuring diminishing profit margins and fairly frequent years of financial losses won’t serve well in that kind of environment. Amazon has built itself over the years precisely by avoiding that kind of thinking, yet its ability to continue to do so may be very linked to the identity of its founder and CEO. If the company can stay the course, it has a long way to grow before changing plans and flipping the switch would make sense. In the U.S., e-commerce sales still account for just about 18 percent of retail sales (excluding food service). Another 21 percent or so is motor vehicle parts and dealers, a market that’s generally not accessible under the current legal regime in the U.S. but could certainly be addressed in the future. And at the moment, Amazon is considerably less global than other major American technology companies. They have a large presence in Germany, the U.K., and a few other countries, but they don’t exist in markets ranging from Korea and China to Poland and the Persian Gulf. In principle, all sorts of things we don’t normally consider “retail” could be sold through the world’s largest online retailer. Car insurance. Plumbing. In some ways, the sky’s the limit. Even in its wildest dreams, the everything store will never entirely monopolize the marketplace. The company that offers the best price and the greatest convenience will always be vulnerable in market segments where price and convenience aren’t the most important consideration. That especially means higher-end niches where people will gladly pay a penalty to stand out from the pack. But high-end niches are, by definition, niches. The mass market where value conquers all is bigger. And growth is growth. Amazon hasn’t earned much profit over the past three years, but is there any doubt that today’s much-larger version of the company is a more valuable enterprise than the smaller version of January 2011? Whether shareholders will continue to accept this logic is an open question, but there’s no particular reason they ought to abandon it. For the foreseeable future, the party can—and will—go on, crushing everything in its path and generating mighty gains for consumers. Correction, Jan. 31, 2014: This article originally misspelled the brand Gillette.